We offer a full line of double pipe and multi-tube hairpin exchangers for both new applications and the hairpin aftermarket. True counter-current flow allows a deep temperature cross in one unit where TEMA F or multiple series connected multi-pass S/T exchangers are required. Economical at extremely high pressures (10,000 PSI). U-tube design and all nozzles on one end making hairpins ideal for high temperature applications where linear and differential expansion are issues. Hairpin are available in all weldable materials including titanium. Double pipe hairpin shells range in size from 2" to 8" nominal pipe. Multi-tube hairpin shells range in size from 4" to 36" nominal pipe. Overall unit lengths are limited only by pressure drop and transportation economics. The alloy 625 unit shown above was designed for tubeside 800 PSI MAWP at 1400F MAWT and shellside 150 PSI at 750F. 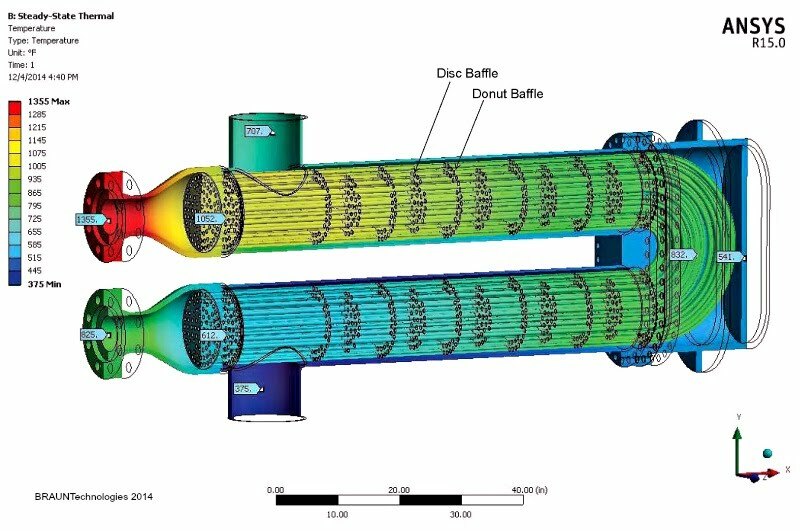 Disc and donut baffles were used to minimized shellside pressure drop and eliminate tube vibrations.